Since I’ve been on Instagram; as zulucowbylucy I’ve discovered some really imaginative and inspirational Interiors accounts. 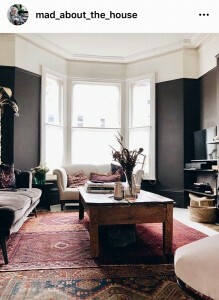 I particularly enjoy established Interior designers’ accounts…which inform and advise on interiors’ techniques and how to style one’s home. 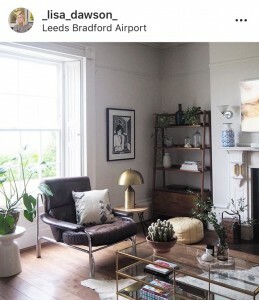 Her smart, calming, sitting room with its aubergine accents; elegant ‘Earl Grey’ sofa and gilt ‘Rockett St George’ palm tree, standard lamp; first grabbed my attention. I love her blend of classical and inspired contemporary accessories. All her rooms look so polished. 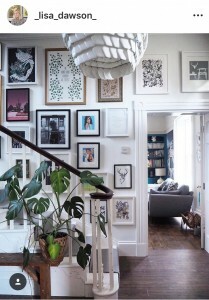 If you need practical advice on new trends, and how to decorate your home, Kate is your lady. 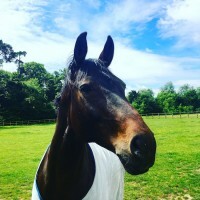 As well as her excellent book: ‘Mad About the House,’ (how to decorate your home with style) she’s just released a fun and informative podcast: ‘The Great Indoors’ with Sophie Robinson. They launched a couple of weeks ago, with the controversial statement: ‘Grey is Dead’?! Bit controversial! 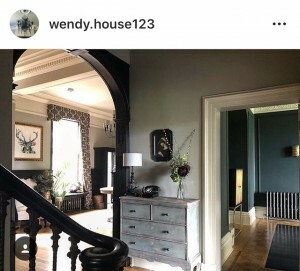 Secondly, I love the way she’s decorated this mansion; cleverly using different paint hues, in adjacent rooms to create an elegant, fluid movement between the rooms. 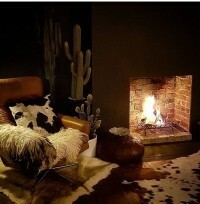 I love her classic furniture teamed with striking, contemporary lighting and her traditional fireplace accompanied on either side by two funky cowhide chairs – inspired!! 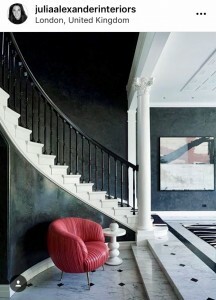 A warm combination of elegant interiors and fun modern twists – Love it! 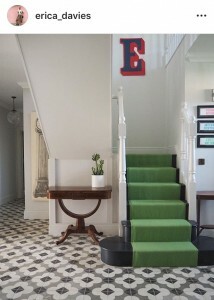 I was first attracted to Erica Davies interiors, when I saw her stunning apple green stair runner! We had recently extended our house by adding on a conservatory and splashed out on gorgeous apple green ‘Voyage’ curtains.’ I have a thing about fresh, bright green and was hooked. I love Erica’s bold, colourful statement home; filled with indoor plants; bright colours, flowers, prints and her joyous ‘joie de vivre’ motto: “Fill your home with things that spark joy.” An approach I adhere to with interiors: I eschew trends and instead prefer prints or pieces which evoke memories of travels and fun holidays. Our house may look a bit eclectic; but hey it’s got character and it’s our home! I’ve followed the inimitable, Lisa Dawson for more than a year now. It was her excited ‘Stories’ (brilliantly delivered – whilst painting; diy-ing, or cooking, without make-up) which first attracted me! 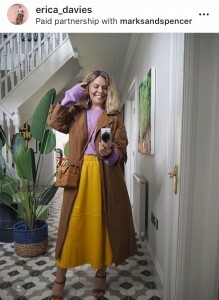 Her passion for interiors is magnetic – and her ideas on, for example: how to design the perfect gallery wall, shop your home or how to add edge to a room with texture and vintage buys, juxtaposed with more contemporary brands, is always inspiring. She makes interior design affordable and accessible for people like me. Julia’s instagram ‘Stories’ @juliaalexanderinteriors are a compelling watch: filled with interesting, informed interior ideas, to deploy in one’s own home; her energy is contagious and I love learning, from an expert about classical interior style, from different eras and countries. Like ‘Mad About The House,’ she’s a trained interiors expert. Zulucow Competition! 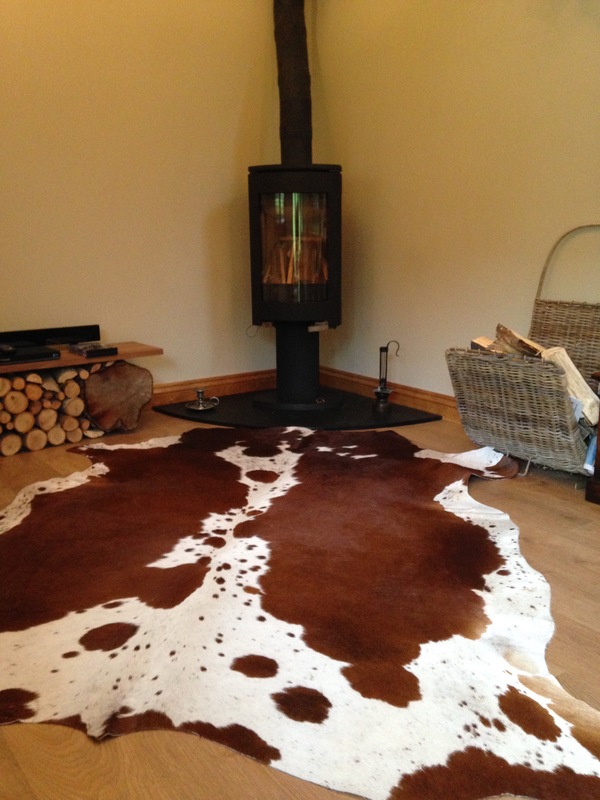 Win a Stunning Zulucow Cowhide Rug!